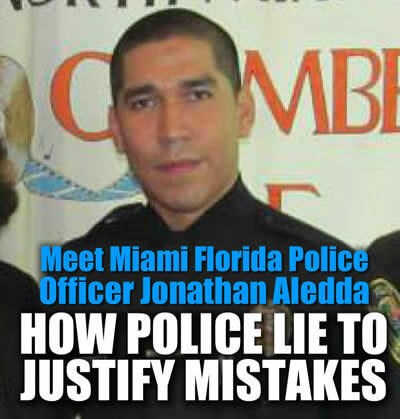 Meet Miami Florida Police Officer Jonathan Aledda who shot an assault rifle 3 times hitting an unarmed innocent victim then made up a story trying to rationalize wrong. The victim made it clear this officer stated after he was asked “Why did you shoot me” he stated “I don’t know”. Yet the police union now has the officer changing his story which is done to lower the accountability by the city and state. Lying is actually very common and we saw this with the police report written by Michael T. Slager who executed Walter Scott in South Carolina. Think this is isolated? Facts and millions of documented events tell another story where “perjury” which is a felony is never addressed. From those we trust to protect lying and perjured documents is epidemic. What’s worse it the epidemic of not doing anything, cover up, manipulation and failure by a broken legal system which backs these criminals with badges regardless. They’ll even stood to destroy the character of the victim in efforts to “make this appear they deserved it”. Yet that officer who committed the perjury or crime is protected and his history of crime is protected. If this is who they claim to be the best officer ie. “Officer of the Month” we’re in trouble because this is exactly who never should have deadly force or authority of any kind. Obvious poor judgement by someone like this is going to get someone killed. This officers actions from the onset were 100% wrong, if he could not tell the difference between a toy and a gun he never should have shot period. Shooting the wrong person points to a lack of skill or training with a weapon he has no business possessing. “The Other Officer Involved, Commander Emile Hollant, Has Been Suspended Without Pay”. Hollant has been disciplined for “providing misinformation” about Kinsey’s shooting. He should be fired, seeing he’s a proven liar. Don’t agree remember this: On July 22, 2016 Officer Jonathan Aledda was placed on administrative leave due to conflicting statements given to the investigators looking into the shooting of Charles Kinsey. The shooting occurred on July 20, 2016, when Charles Kinsey was trying to retrieve a 23-year-old autistic man who ran away from the group home in North Miami. Neighbors in the area called the police concerned that the autistic man was holding a gun, but it ended up being a toy truck. When police arrived at the scene, Charles raised his hands in the air with his body laying on the ground. He attempted to communicate to police that he was no threat and a professional trying to help his patient. Officer Aledda shot at him anyway. The lying and perjury MUST be stopped and the root cause to lost respect for police today. Only monthly polygraphs can solve this but imagine how many more officers would have to be terminated when the truth came out. The North Miami Officer Jonathan who shot an unarmed caretaker who had his hands in the air while trying to kill his autistic companion for holding a toy truck was named “Officer of the Month” in September 2013. Officer Jonathan Aledda, 30, who has been a cop for four years, also won an “excellence award” after graduating from a nursing program at the University of Miami in 2008. “I took this job to save lives and help people,” Officer Jonathan Aledda said in a statement this week after the story of him shooting caretaker Charles Kinsey in the leg went viral. But it was hardly a split second considering police were on the scene for 15 minutes before he opened fire, a period of time police said they were negotiating with Kinsey and the 24-year-old autistic man holding the toy truck. And during that time, Kinsey told officers on the scene pointing their weapons on them that neither one of them had a gun. While a police union president said the shooting was completely justified because Officer Jonathan Aledda was trying to protect Kinsey from being shot with the toy truck, his commander, Emile Holland, has been suspended without pay for trying to fabricate the police report of the incident.